Hello, Blog Hoppin' friends. 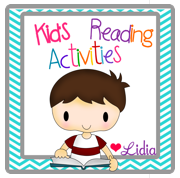 I am Lidia from Kid's Reading Activities. I am very excited to be a part of your community. I have taught 15 years and most of my experience has been in Kindergarten. I am always amazed at how much these little ones can learn. I love to create reading activities, especially thematic literacy centers and other fun activities. 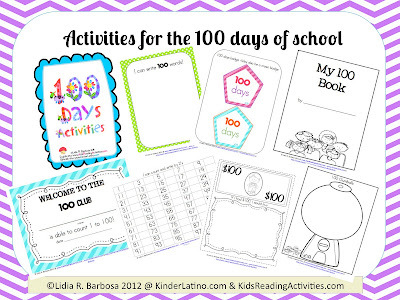 Today, I have some ideas and free printables for the 100 days of school. I have also included a parent letter for a fun family project. 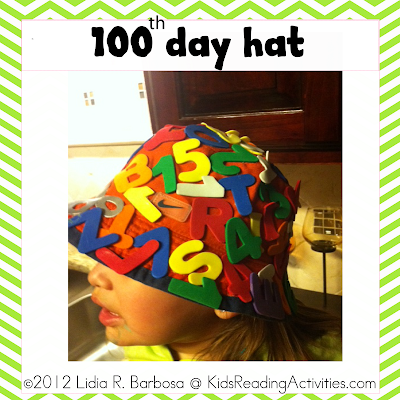 In this project, parents will help the child glue 100 small items on a hat. Click on the picture to hop on over to my blog for the parent letter, free printables and more fun ideas.